Sometimes it can be very hard to recruit participants for usability testing! Recently, our long term client, SAI GLOBAL Property Services (previously Espreon), needed to test its new, ‘game changing’, self service property settlement booking system with a representative sample of solicitors and legal practice managers. These users are so hard to track down! We just couldn’t find any to book into a testing session at our lab in George St, Sydney. 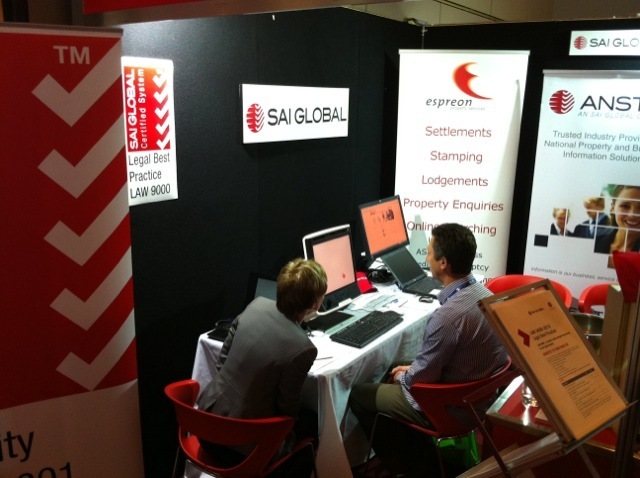 at the Australian Legal Practice Managers Association (ALPMA) Conference where SAI GLOBAL was sponsoring and had a booth. This was a really successful method of accessing people who’s time is precious. In one day Joanna Lewis was able to test with 12 people in sessions ranging from 20 – 45 minutes. She accessed 5 solicitors, 2 legal practice managers and 5 SAI GLOBAL employees. A perfect number to give us valuable feedback on the final version of their interactive and graphically designed prototype site. 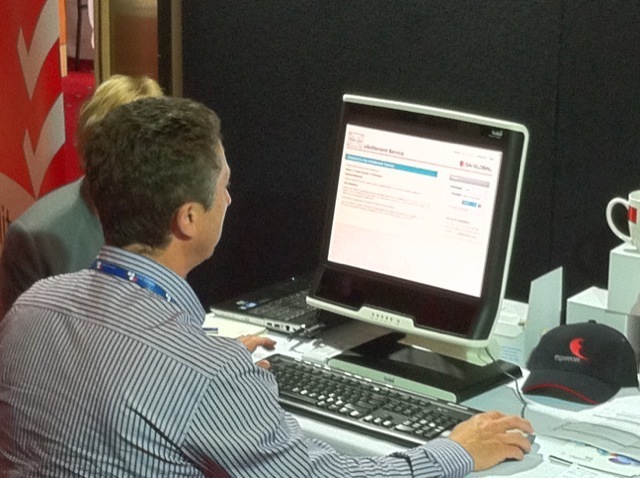 I went along to the session to help invite participants into the stand for the testing session while Joanna was busy. However, the SAI GLOBAL sales staff did my job for me! One woman in particular recruited all of the key users we needed!! And recruiting was easy because people were keen to see the eye tracker in action! Of course the Tobii T60 eye tracker that we used is portable and we could quickly set it up in the morning before people arrived. We used the Retrospective Think Aloud (RTA) protocol [pdf].This meant that, whilst people were using the complex online application, we could leave them alone to focus on the task at hand. We had originally planned to test the system using 2 tasks, but soon realised participants wanted to leave once the first task was completed. So we got participants to complete the process straight through, as one task. When they were finished Joanna replayed them their eye gaze video to stimulate discussion and gain insights on how to improve the prototype. Final discussion questions also had to be speedy – just likes and dislikes. Here’s a heat map that we created after the testing to demonstrate some of the findings to the SAI GLOBAL executive. 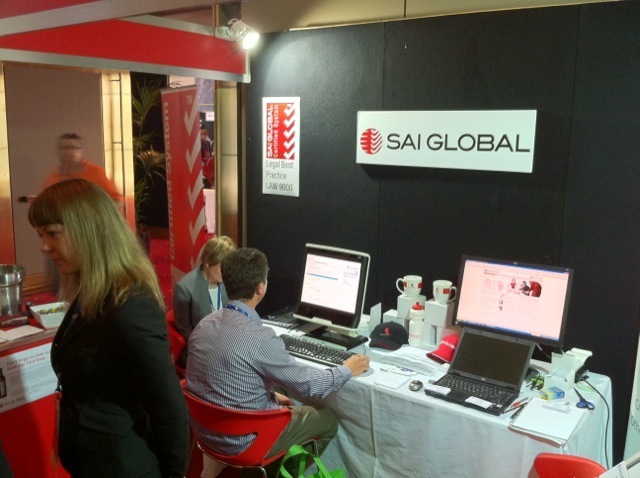 As a bonus for SAI GLOBAL, the eye tracker meant that sales staff could actively engage with customers during the conference and describe what Joanna was doing. This helped get people into the stand and demonstrated that SAI GLOBAL care about how their applications are designed, making sure customers find it easy to use. Also, the sales staff were actively engaged in the research process. I am sure that they will use the experiences of the day regularly in future sales meetings! And we have already received feedback from a very happy CEO! This entry was posted in Uncategorized and tagged Case Studies, Eye Tracking, usability testing by Objective Experience. Bookmark the permalink.